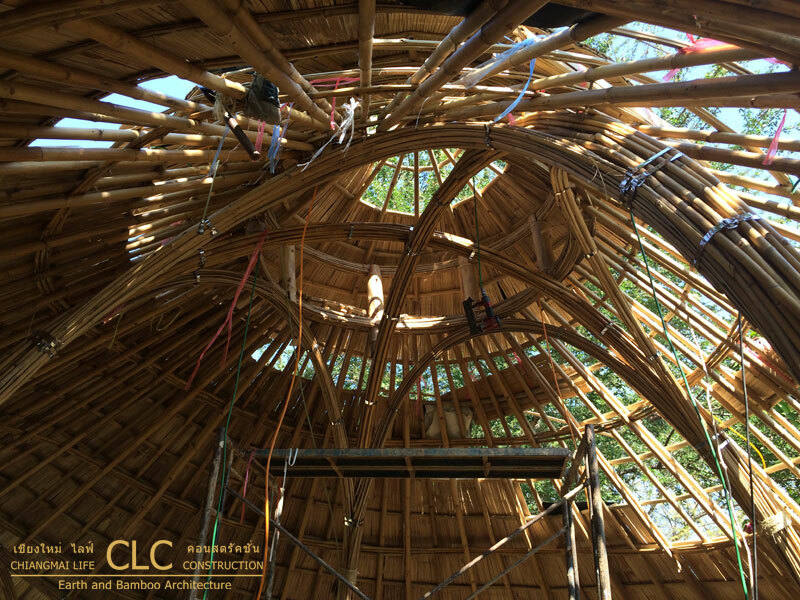 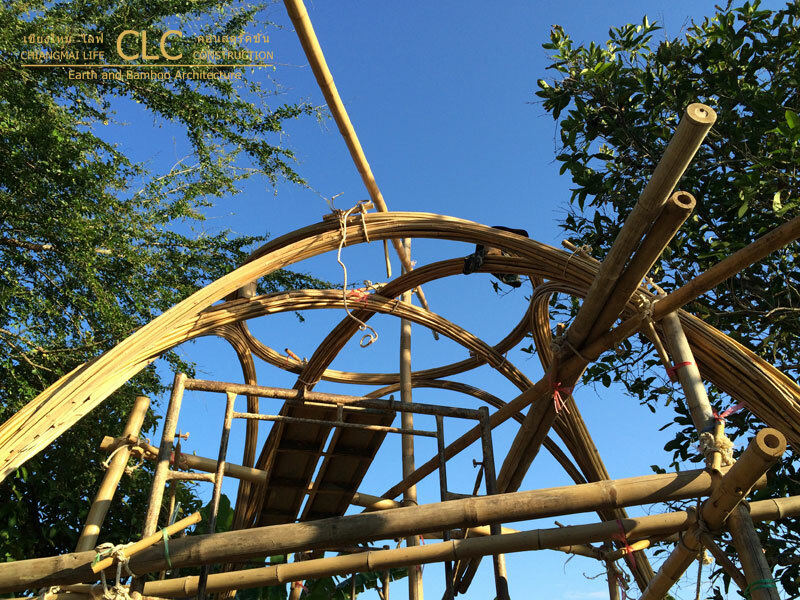 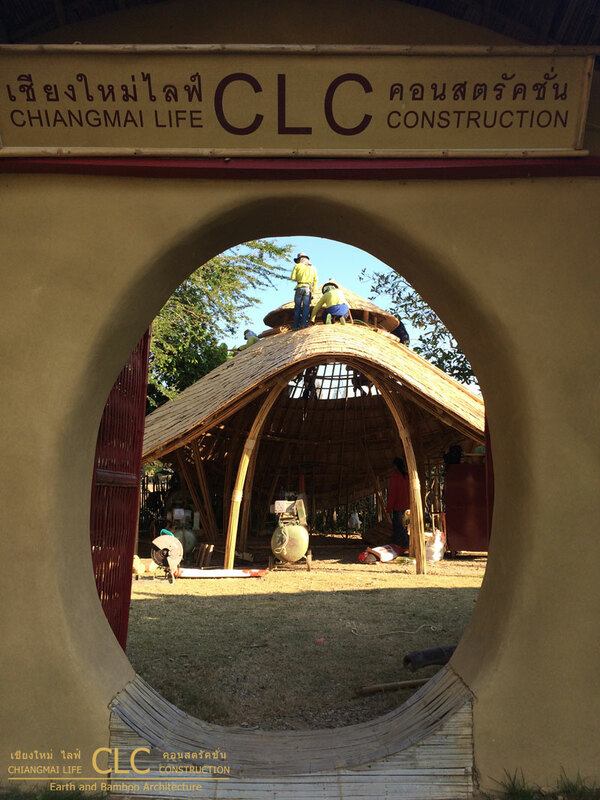 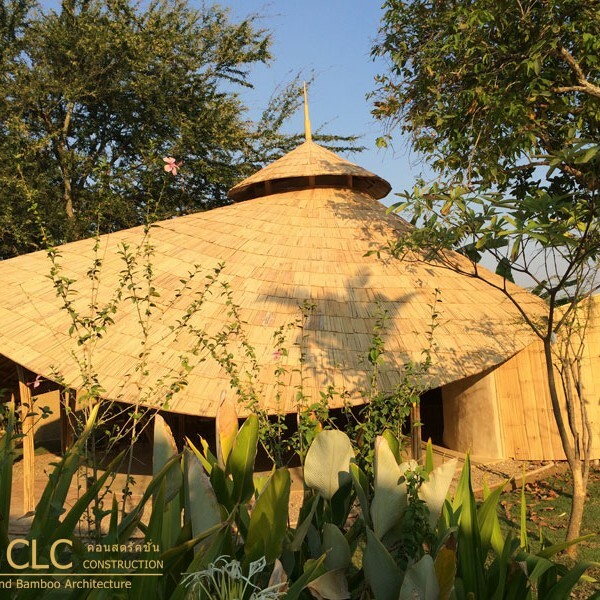 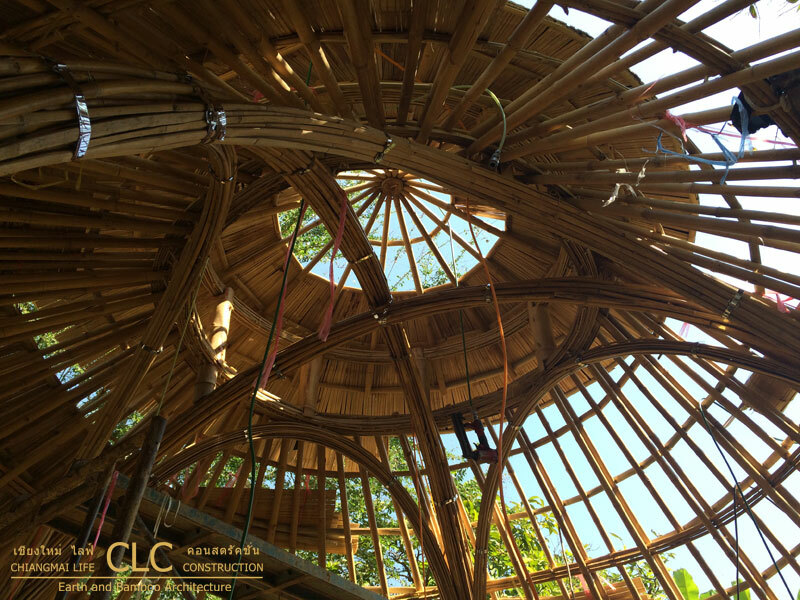 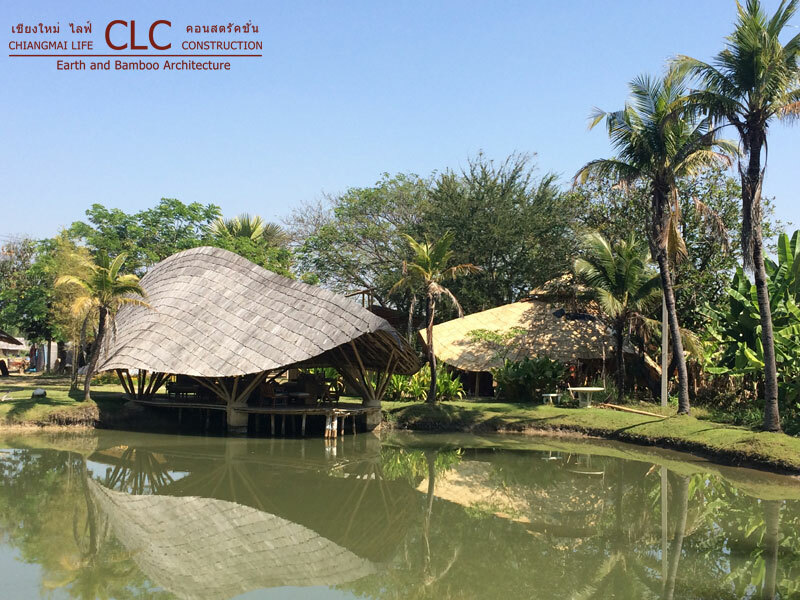 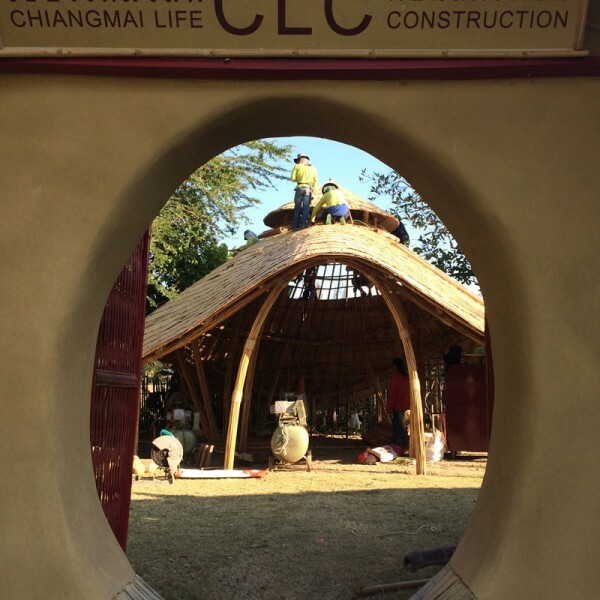 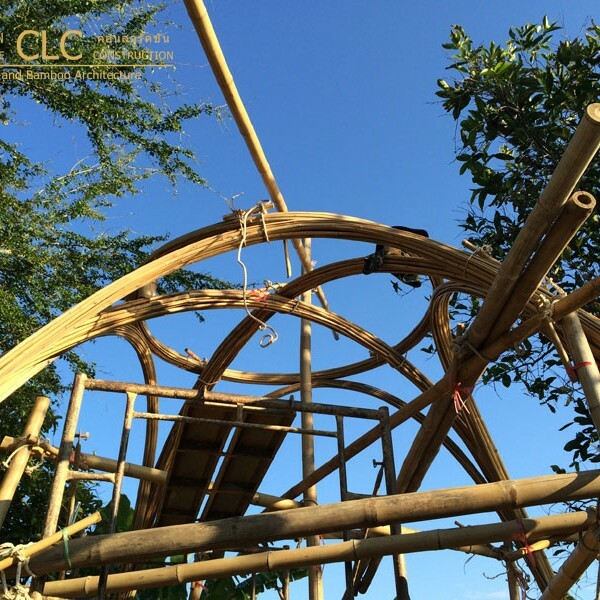 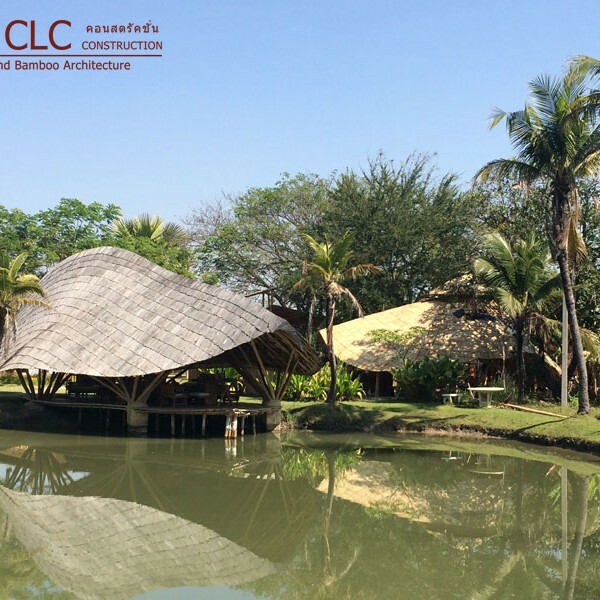 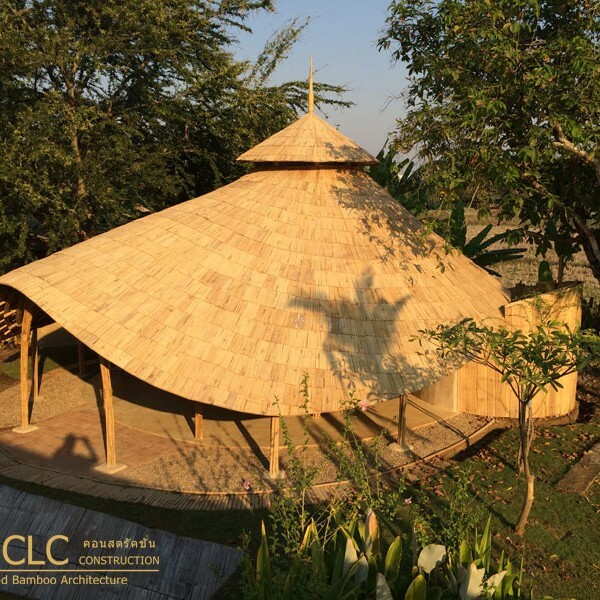 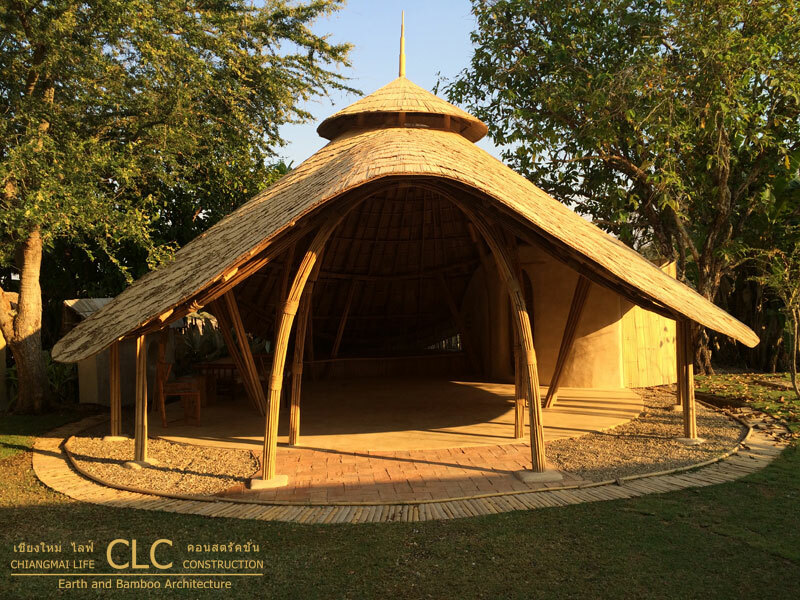 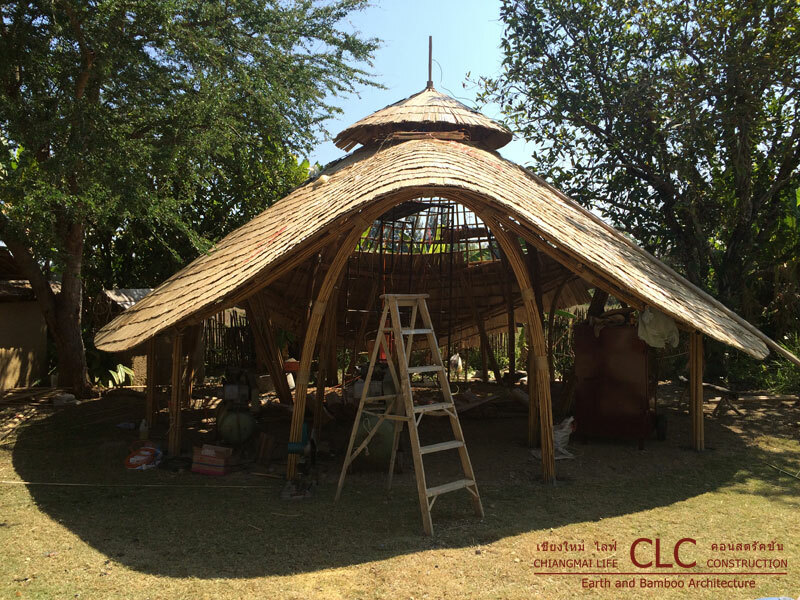 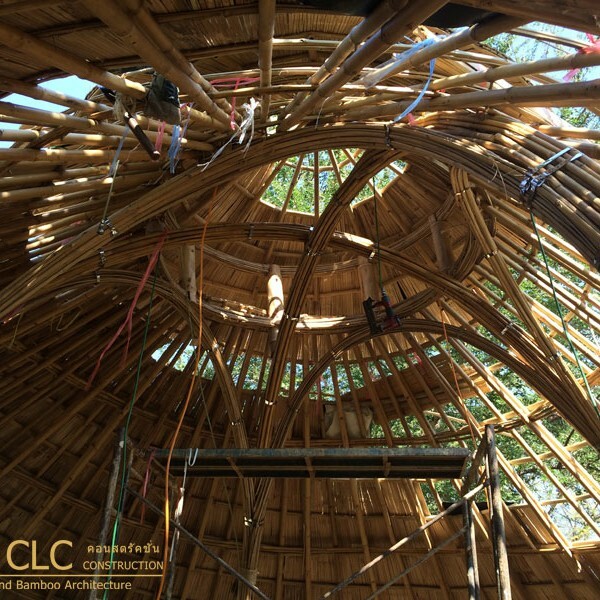 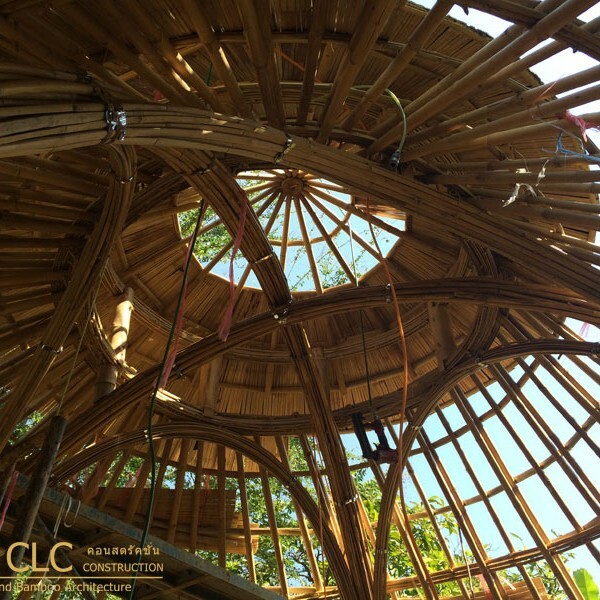 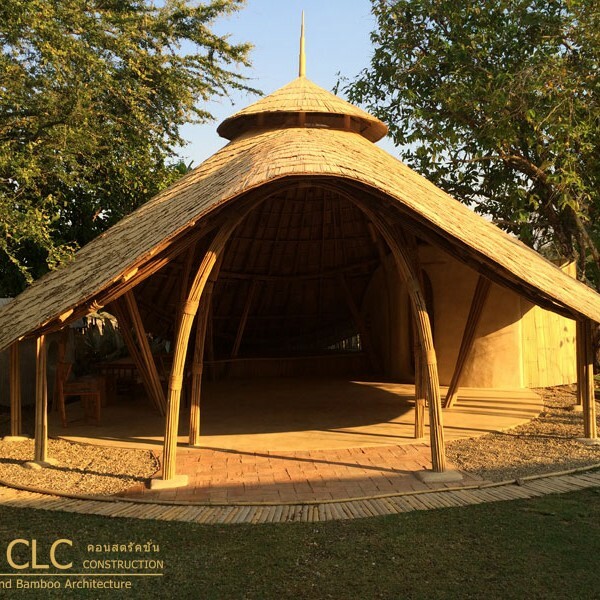 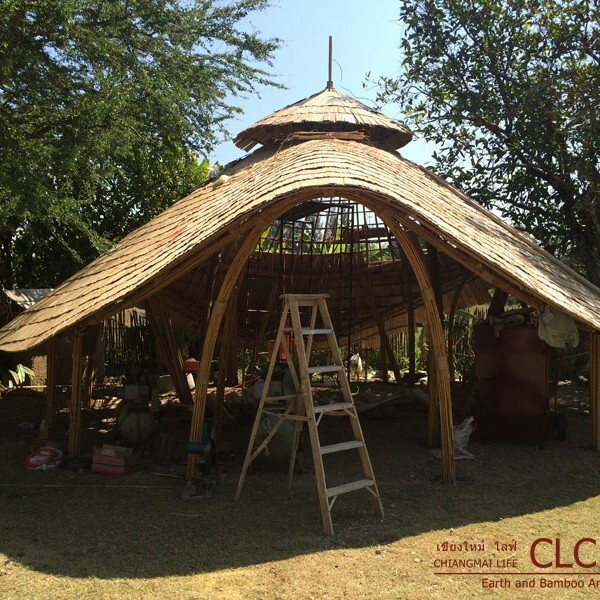 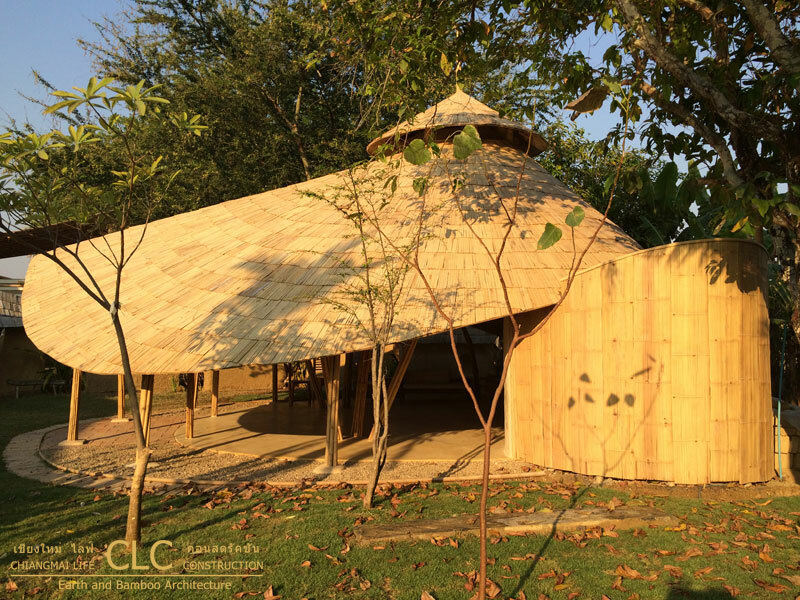 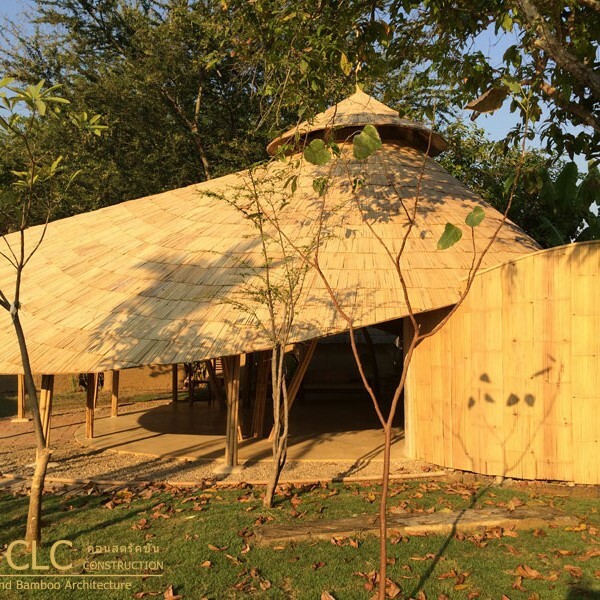 This bamboo dome sala (bamboo pavilion) project represents a landmark change in Chiangmai Life Construction bamboo architecture development. 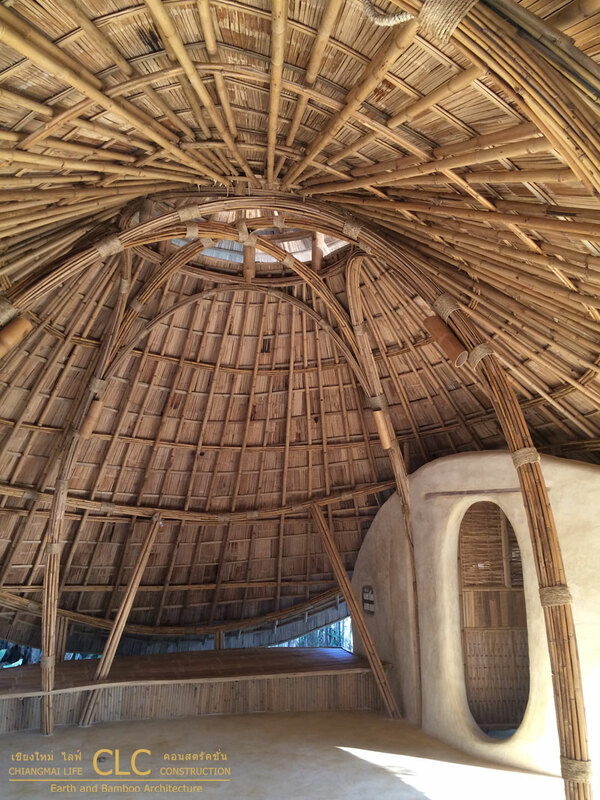 In our previous salas we used big diagonal bamboo culms as structural support like most other bamboo architects. 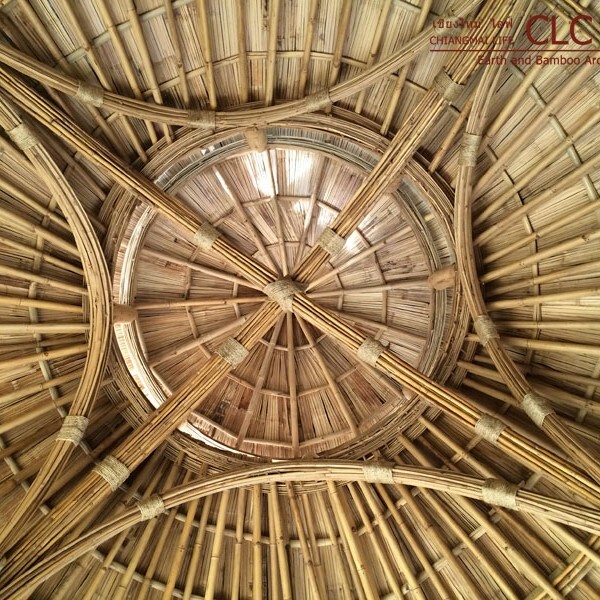 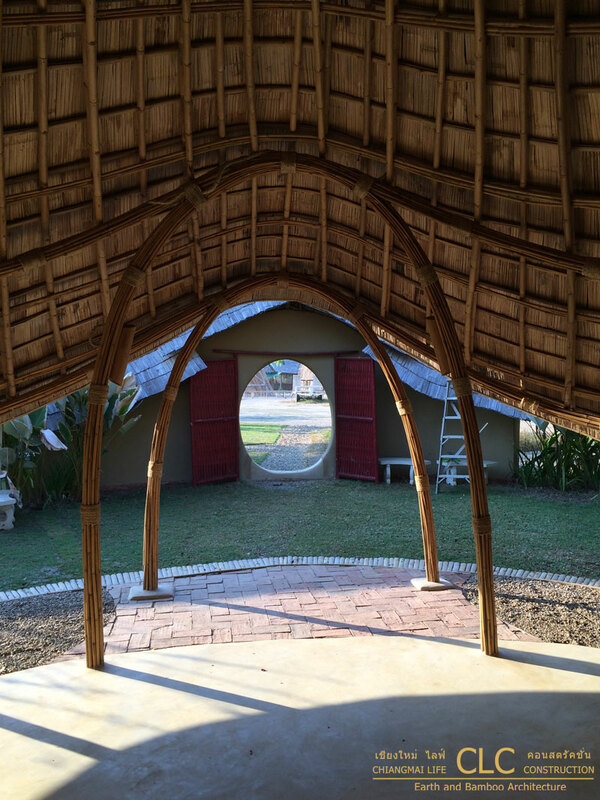 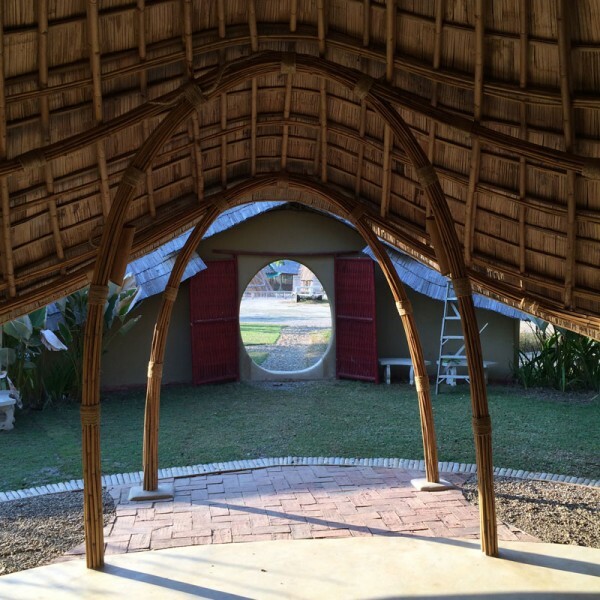 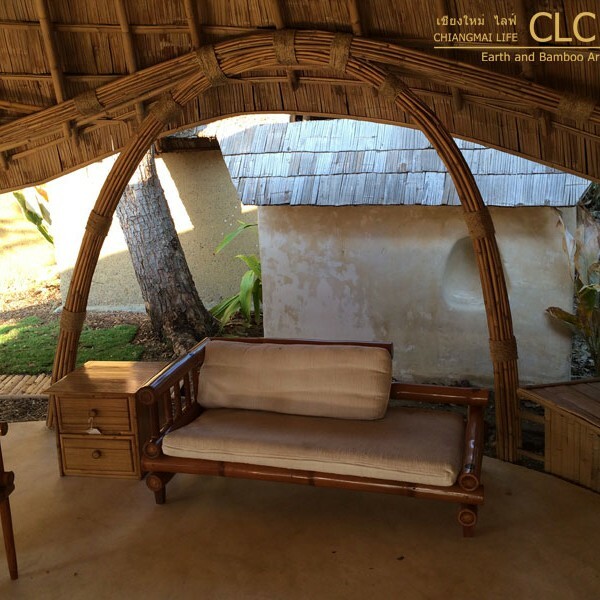 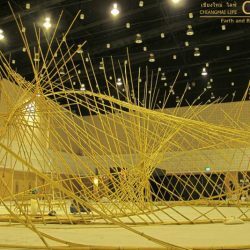 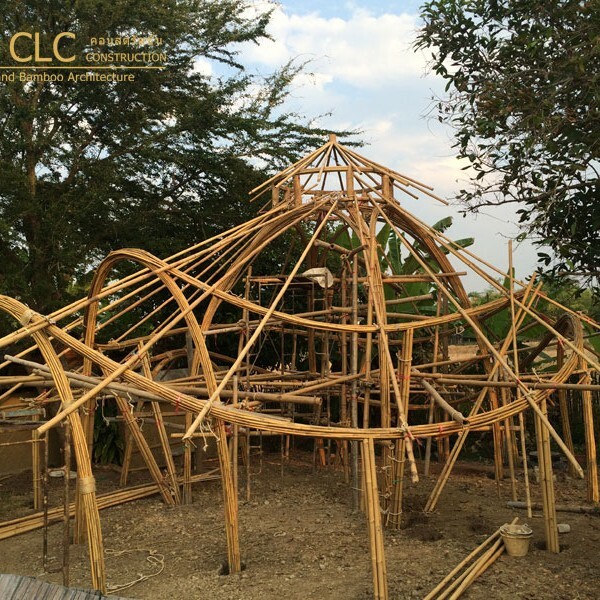 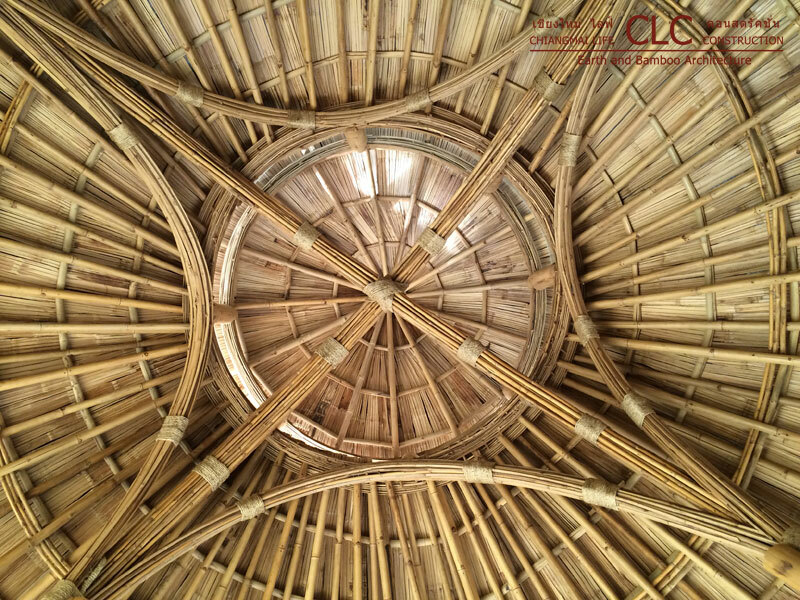 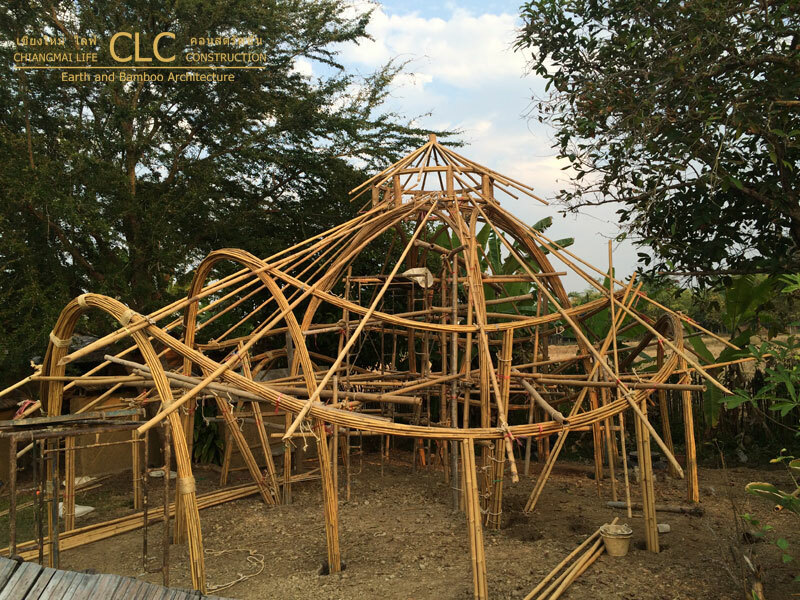 With this Bamboo Dome Sala we are emphasizing a finer and more space oriented kind of bamboo architecture by introducing bamboo arches as main design feature as well as structural element. 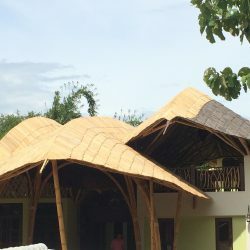 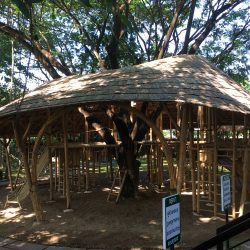 These arches as well as the outer rim which, gives the bamboo roof it’s free-flowing form are made of bundled bamboo beams. 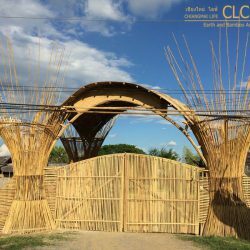 These bundles are made from smaller species of bamboo instead of big and heavy culms. 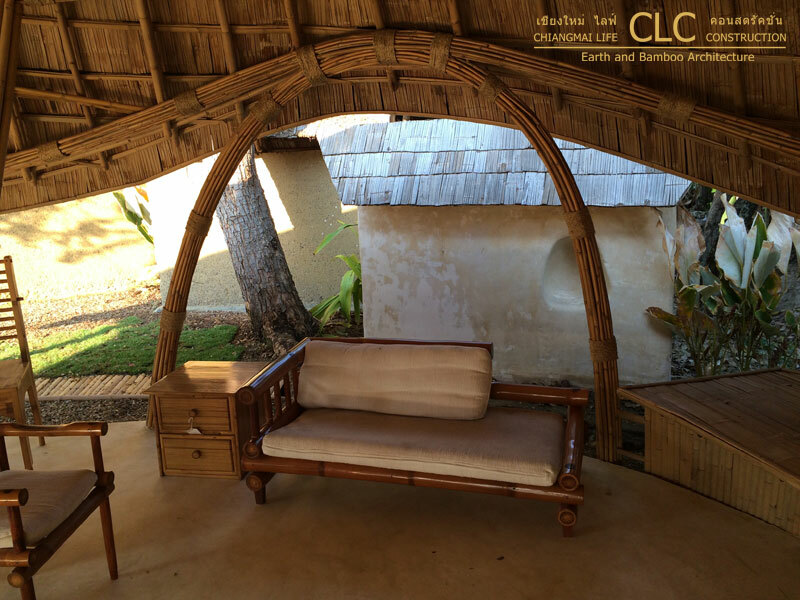 This design creates a finer and more artistic ambiance than the heavier single bamboo culms used preciously. 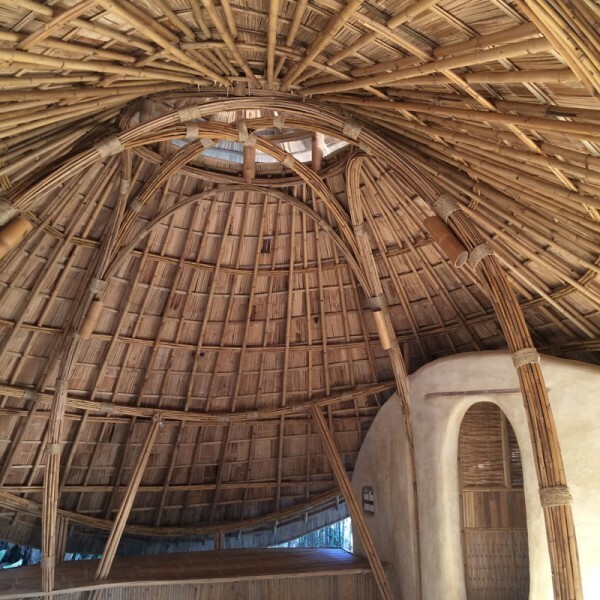 Inserted on one side of the bamboo dome sala is a half open bathroom. 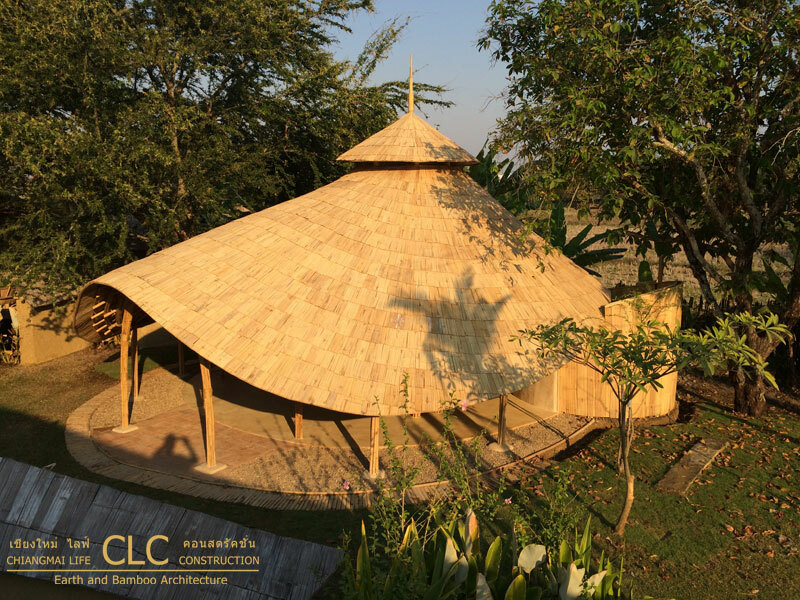 It features a toilet and wash basin covered by the roof and a shower out in the open. 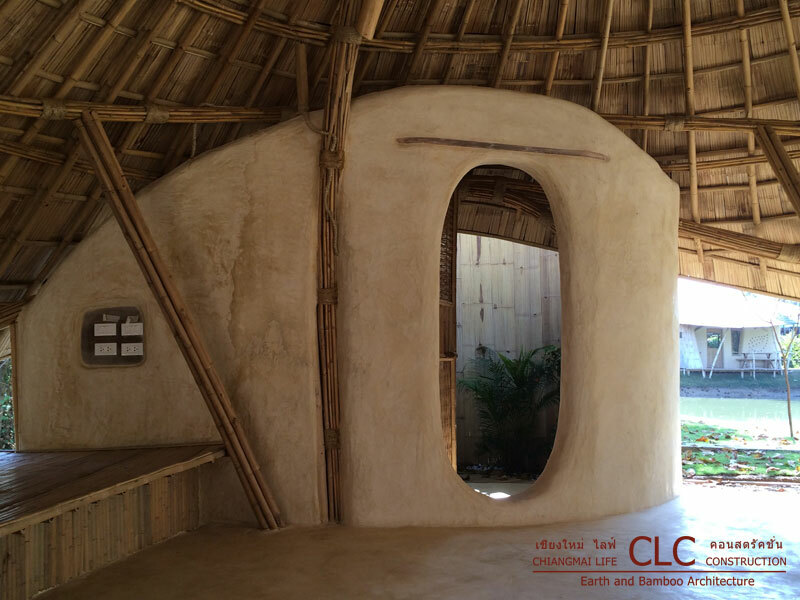 This space is surrounded by earthen walls on the roof covered side and a bamboo wall on the outdoor side. 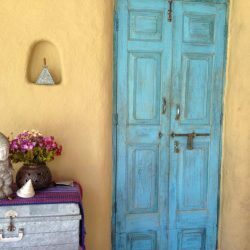 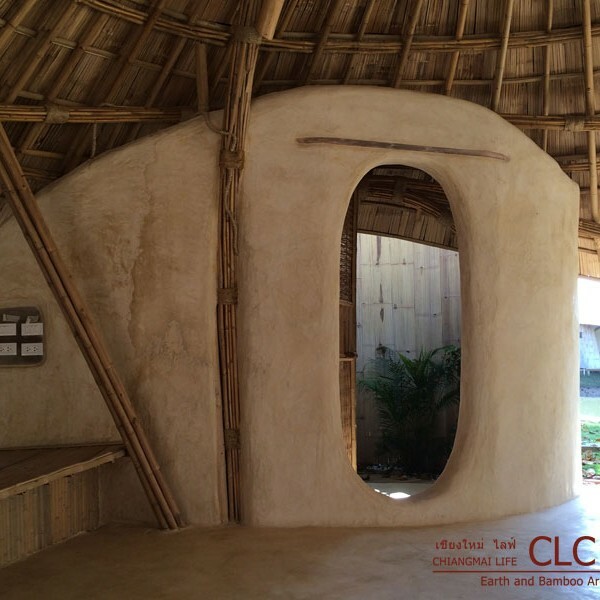 The earthen walls are built using 2 types of earth construction techniques – Adobe bricks and wattle & daub. 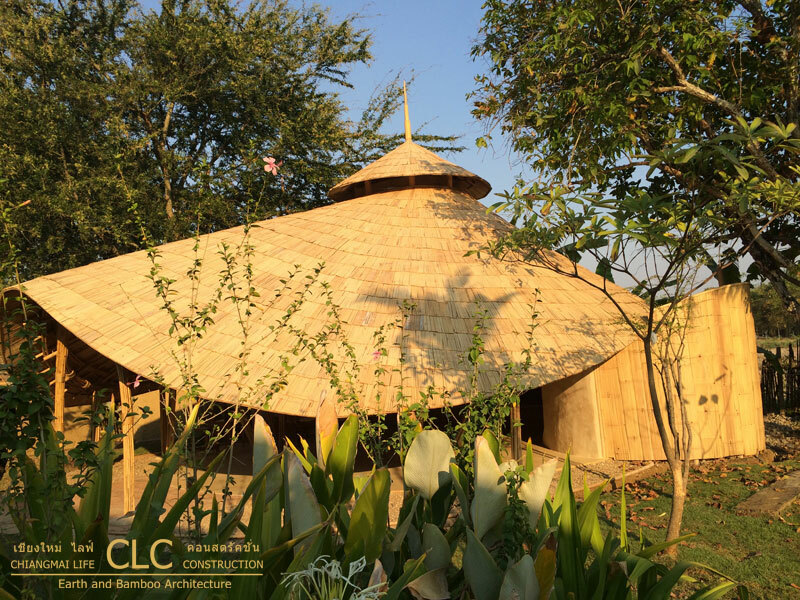 To better integrate the earth with the bamboo architecture, the walls were made in a fine finishing with a light golden color.